Coinciding with the golden jubilee of Chemplast Sanmar, a state-ofthe-art Research Laboratory at an outlay of Rs 1 crore has been set up by Chemplast in the Department of Environment Engineering at IIT Madras. The laboratory aims to carry out research on Zero Liquid Discharge (ZLD) in close collaboration with user industries by providing the necessary test facilities for evaluating new/modified technologies related to ZLD. Mrs. Madhuram Narayanan Charitable Foundation funds the ‘Save-a-child’ scheme and provides a lifeline to children with heart disease through Apollo Hospitals Charitable Trust. 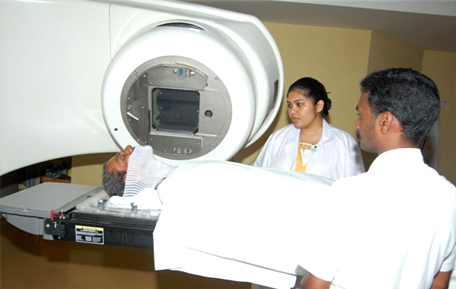 The foundation works with the philanthropic wings of industry associations such as the Confederation of Indian Industry and NGOs such as The Banyan and REACH for tuberculosis research. The Madhuram Narayanan Centre for Exceptional Children bagged both national and regional awards at the India NGO Awards 2012-13 organised by The Resource Alliance and supported by Rockefeller Foundation and Edelgive Foundation. 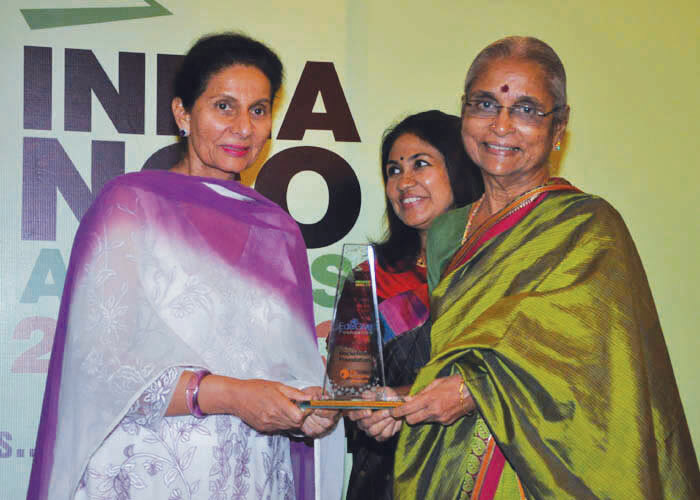 Jaya Krishnaswamy, Director, MNC, received the national award from Preneet Kaur, Minister of State, External Affairs, Government of India, at a function held on 13 August 2013 at the India Habitat Center, New Delhi. The 27th Annual Day of Madhuram Narayanan Centre for Exceptional Children was celebrated with great gusto at the Bengal Association Hall, Chennai. Samyam, a reunion of past and present students, has been celebrated at Madhuram Narayanan Centre since 2013 during the month of July. While past students find guidance and reassurance from MNC teachers, the new entrants find motivation in coming together with past students. As a platform for bringing children and parents together, Samyam helps them to ideate and maintain continuity with MNC for guidance and counselling. Parents of new entrants are motivated to face challenges in bringing up and training special children. Sanmar Engineering, Karapakkam, has been sponsoring the educational institution Ellen Sharma School for several years now. B Visweswaran, Vice Chairman of Sanmar Engineering Technologies Limited, took time to visit the school and inspected the damage post Vardah cyclone. Sanmar had previously donated to the school kitchen and now the school compound wall had been damaged by the cyclone. Visweswaran presented a cheque to the school correspondent, Sakhunthala Sharma, who conveyed her appreciation for the support provided by Sanmar. The Sankara Schools (Sri Sankara Senior Secondary School, Adyar and Sri Sankara Vidyashramam Mat. Hr. Sec. School, Thiruvanmiyur) in Chennai have made a name for themselves as well-known institutions. These schools offer curriculum, which are of the highest standards, and are professionally run by a Board of Trustees. Principal of Sri Sankara Vidyashramam Kalpalatha Mohan (3rd from left) and Vice Principal Sai Geetha with the John Warner School team in Hertfordshire, UK. The Parampara Heritage Club of Sri Sankara Vidyashramam Matriculation Higher Secondary School has been chosen by INTACH for receiving a certificate of commendation for outstanding contribution to heritage conservation and awareness. The school is the first one in the State to receive this commendation. Sri Sankara Vidyashramam Matriculation Higher Secondary School, Tiruvanmiyur, Chennai, now has a state-of-the-art auditorium that can accommodate up to 300 persons, complete with air-conditioning and acoustics facilities. Named after VS Dhandapani, the Managing Trustee of the Sankara Schools for more than two decades, the auditorium was inaugurated on 31 October 2013 by Mrs Gomathy Dhandapani. 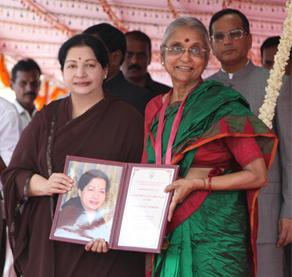 Padma Venkataraman, daughter of R Venkataraman, former President of India, unveiled a plaque which has inscribed on it the words ‘R Venkataraman Campus’ for the Sankara Vidyashramam school premises. 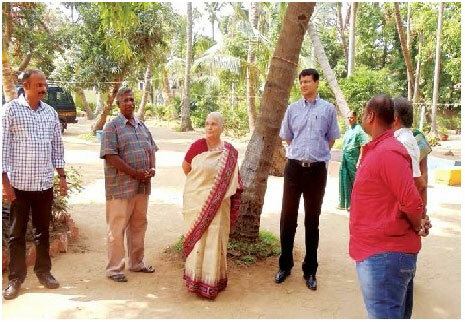 N Sankar, N Kumar, V Sriram, Dr Lakshmi Vijayakumar, Trustees of the Indian Education Trust, Mrs Dhandapani, Chandra Sankar and other family members, Principals and teaching faculty of both Sankara schools were present. Children of both schools gave song and dance rendition which enthralled the audience for almost two hours. (L to r): Kalpalatha Mohan, V Sriram, N Kumar, Dr Lakshmi Vijayakumar, Gomathy Dhandapani, Subala Ananthanarayanan, Padma Venkataraman and N Sankar at the inauguration. The Madhuram Narayanan Centre for Exceptional Children founded by The Sanmar Group in 1989 provides early intervention and specialised training for children with various types of developmental delays and associated conditions. Training at the Centre is based on the ‘UPANAYAN' – Early Intervention programme developed indigenously by a team of experts. The Centre in its 20+ years service has on its journey, guided, counseled and trained parents in the care of over 3,500 children. Mrs. Jaya Krishnaswamy, Director, Madhuram Narayanan Centre for Exceptional Children, Chennai, received the "Best Social Worker Award - 2012" in the field of Differently Abled Persons from the Hon'ble Chief Minister of Tamil Nadu Selvi. J. Jayalalithaa on 15th Aug. 2012 at Fort, Chennai. The Madhuram Narayanan Centre (MNC) for Exceptional Children's ‘moving ahead' programme enables children with developmental delays to continue school education in special and mainstream schools after completing the early intervention programme. Over the last few years, students have been successfully enrolled in mainstream schools. It is a graduation day of a different kind indeed at MNC. 11 children from the Madhuram Narayanan Centre for Exceptional Children (MNC) will be moving into mainstream schools in the coming academic year. 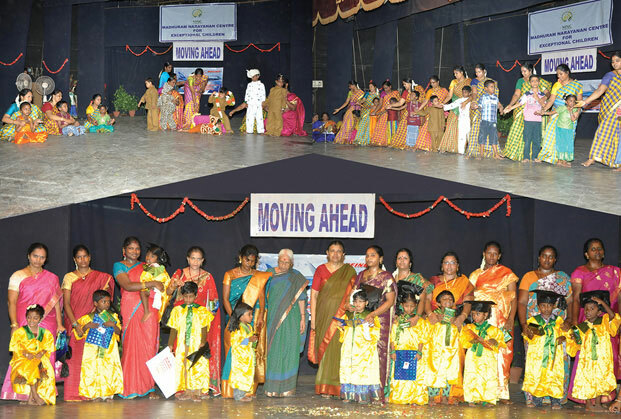 To mark this, MNC conducted 'Moving Ahead', an event to mark the successful completion of the early intervention programme on 19 April 2013. Director of the Centre of Training and Resources in Early Childhood Education, Chennai, Prema Daniel was the chief guest for the event. Of the 11, two are from Govt El Centre, two from SRTC Autism Centre and seven from MNC. In addition, two children will be moving to Little Flower School for the Visually Challenged. These children had developmental delays of different types and degrees, and through early intervention they have now been integrated in mainstream schools. The institute has successfully enrolled 51 children in mainstream schools over the past six years. The children are guided and directed by therapists and special educators, with the aid of music, yoga and play therapy. The children proudly went up on stage, clad in graduation hats and overcoats, to receive gifts from the chief guest. Their parents were, understandably, at a loss for words as they shared the experience of the improvement witnessed in their wards.